Featuring a jagged and chunky phylon sole unit, the Run M is a literal interpretation of the original Runner M, first introduced in 1997, and designed specifically for footballers to wear while training. The updated style features a tonal tan and clean all-white colorway and two classic combos of sporty Ibiza blue and bright yellow. All styles include a performance mesh upper, oversized outsole and branding across the sneaker. The Run M also features bold paneling details that wrap and support the midfoot and forefoot for an on-trend silhouette. The Neptune stays closest to its original silhouette, featuring a nostalgic speed lacing system and mesh panels. The sneakers combine vermillion, bright yellow, Ibiza blue and nimbus cloud. 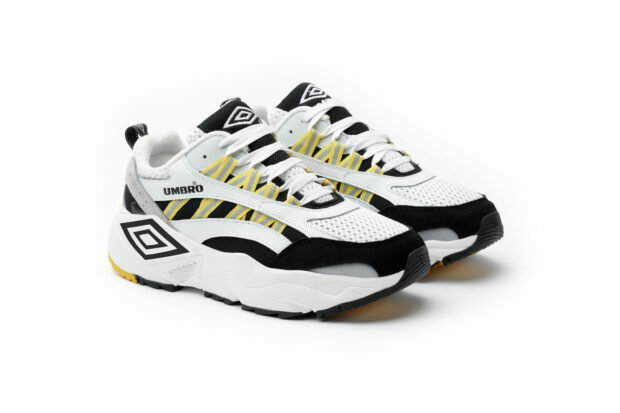 A heavy logo presence includes an oversized black Umbro double diamond on the white outsole, logo across the side of the upper and an embroidered white logo on the tongue. The Neptune is also updated with a thicker injected phylon sole unit. The Exert Max features a chunky, aggressively textured white sole with a soft contrasting upper. The outsole draws inspiration from an archive style originally developed as a training shoe for aerobic exercise. Constructed using a breathable mesh upper featuring a combination of zigzag leather and suede panels, the shoe is available in white, gray, aqua or black colorways with matching monochromatic laces.